The US Census Bureau International Database lists the current population of Kazakhstan as 15,460,484, while United Nations sources such as the UN Population Division give an estimate of 15,753,460. Official estimates put the population of Kazakhstan at 16.455 million as of February 2011, of which 46% is rural and 54% is urban. In 2013, Kazakhstan’s population rose to 17,280,000 with a 1.7% growth rate over the past year according to the Kazakhstan Statistics Agency. Ethnic Kazakhs are 63.1% of the population and ethnic Russians in Kazakhstan are 23.7%. Other groups include Tatars (1.3%), Ukrainians (2.1%), Uzbeks (2.8%), Belarusians, Uyghurs (1.4%), Azerbaijanis, Poles, and Lithuanians. Some minorities such as Germans (1.1%), Ukrainians, Koreans, Chechens, Meskhetian Turks, and Russian political opponents of the regime had been deported to Kazakhstan in the 1930s and 1940s by Stalin. Some of the largest Soviet labour camps (Gulag) existed in the country. Significant Russian immigration also connected with Virgin Lands Campaign and Soviet space program during the Khrushchev era. In 1989, ethnic Russians were 37.8% of the population and Kazakhs held a majority in only 7 of the 20 regions of the country. Before 1991 there were about 1 million Germans in Kazakhstan, mostly descendants of the Volga Germans deported to Kazakhstan during World War II. After the break-up of the Soviet Union, most of them emigrated to Germany. Most members of the smaller Pontian Greek minority have emigrated to Greece. In the late 1930s thousands of Koreans in the Soviet Union were deported to Central Asia. These people are now known as Koryo-saram. The 1990s were marked by the emigration of many of the country’s Russians and Volga Germans, a process that began in the 1970s. This has made indigenous Kazakhs the largest ethnic group. Additional factors in the increase in the Kazakh population are higher birthrates and immigration of ethnic Kazakhs from China, Mongolia, and Russia. Kazakhstan is officially a bilingual country. Kazakh, a Turkic language spoken natively by 64.4% of the population, has the status of “state” language, whereas Russian, which is spoken by most Kazakhstanis, is declared an “official” language, and is used routinely in business, government, and inter-ethnic communication, although Kazakh is slowly replacing it. The government announced in January 2015 that the Latin alphabet will replace Cyrillic as the writing system for the Kazakh language by 2025. 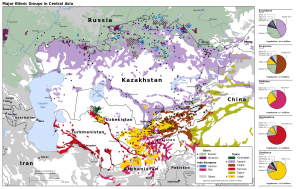 Other minority languages spoken in Kazakhstan include Uzbek, Ukrainian, Uyghur, Kyrgyz, and Tatar. English, as well as Turkish, have gained popularity among younger people since the collapse of the Soviet Union. Education across Kazakhstan is conducted in either Kazakh, Russian, or both. According to the 2009 Census, 70% of the population is Muslim, 26% Christian, 0.1% Buddhists, 0.2% others (mostly Jews), and 3% Irreligious, while 0.5% chose not to answer. According to its Constitution, Kazakhstan is a secular state. Religious freedoms are guaranteed by Article 39 of Kazakhstan’s Constitution. Article 39 states: “Human rights and freedoms shall not be restricted in any way.” Article 14 prohibits “discrimination on religious basis” and Article 19 ensures that everyone has the “right to determine and indicate or not to indicate his/her ethnic, party and religious affiliation.” The Constitutional Council recently affirmed these rights by ruling that a proposed law limiting the rights of certain individuals to practice their religion was declared unconstitutional. Some figures show that non-denominational Muslims form the majority, while others indicate that most Muslims in the country are Sunnis following the Hanafi school. These include ethnic Kazakhs, who constitute about 60% of the population, as well as ethnic Uzbeks, Uighurs, and Tatars. Less than 1% are part of the Sunni Shafi`i school (primarily Chechens). There are also some Ahmadi Muslims. There are a total of 2,300 mosques, all of them are affiliated with the “Spiritual Association of Muslims of Kazakhstan”, headed by a supreme mufti. Unaffiliated mosques are forcefully closed. Eid al-Adha is recognised as a national holiday. One quarter of the population is Russian Orthodox, including ethnic Russians, Ukrainians and Belorussians. Other Christian groups include Roman Catholics and Protestants. There are a total of 258 Orthodox churches, 93 Catholic churches, and over 500 Protestant churches and prayer houses. 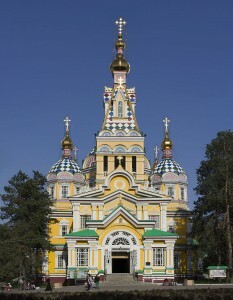 The Russian Orthodox Christmas is recognised as a national holiday in Kazakhstan. Other religious groups include Judaism, the Bahá’í Faith, Hinduism, Buddhism, and The Church of Jesus Christ of Latter-day Saints. According to the 2009 Census data, there are very few Christians outside the Slavic and Germanic ethnic groups. 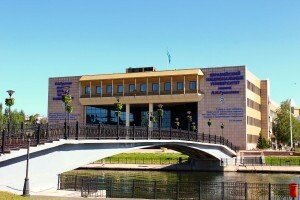 L.N.Gumilyov Eurasian National University in Astana is one of Kazakhstan’s top universities. Education is universal and mandatory through to the secondary level and the adult literacy rate is 99.5%. Education consists of three main phases: primary education (forms 1–4), basic general education (forms 5–9) and senior level education (forms 10–11 or 12) divided into continued general education and vocational education. Vocational Education usually lasts 3 or 4 years. (Primary education is preceded by one year of pre-school education.) These levels can be followed in one institution or in different ones (e.g., primary school, then secondary school). Recently, several secondary schools, specialised schools, magnet schools, gymnasiums, lyceums and linguistic and technical gymnasiums have been founded. Secondary professional education is offered in special professional or technical schools, lyceums or colleges and vocational schools. At present, there are universities, academies and institutes, conservatories, higher schools and higher colleges. There are three main levels: basic higher education that provides the fundamentals of the chosen field of study and leads to the award of the Bachelor’s degree; specialised higher education after which students are awarded the Specialist’s Diploma; and scientific-pedagogical higher education which leads to the Master’s Degree. Postgraduate education leads to the Kandidat Nauk (“Candidate of Sciences”) and the Doctor of Sciences (Ph.D.). With the adoption of the Laws on Education and on Higher Education, a private sector has been established and several private institutions have been licensed. The training and skills development programs in Kazakhstan are also supported by international organisations. For example, on 30 March 2015, the World Banks’ Group of Executive Directors approved a $100 million loan for the Skills and Job project in Kazakhstan. The project aims to provide relevant training to unemployed, unproductively self-employed, and current employees in need of training.